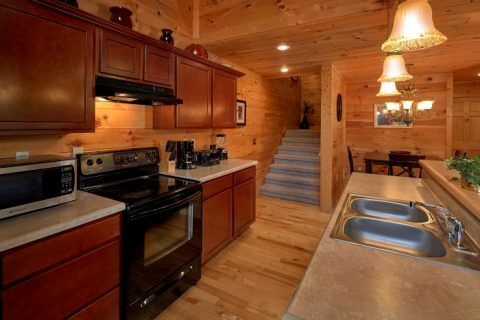 Bring your family and friends to a premium log cabin with everything you need for an excellent stay in the Smoky Mountains! 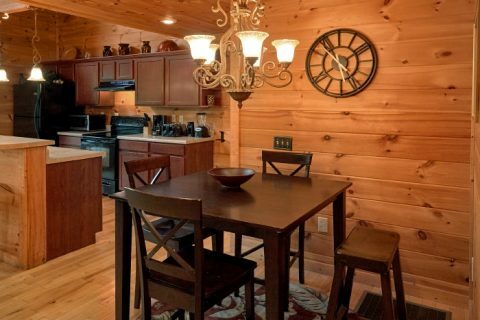 "Fort Knoxx" is a 3-bedroom cabin with room for up to 8 guests, making it a great fit for family vacations or a gathering of good friends. From this cabin's semi-secluded location in Sky Harbor, guests will find it easy to reach both Gatlinburg and Pigeon Forge during their stay. 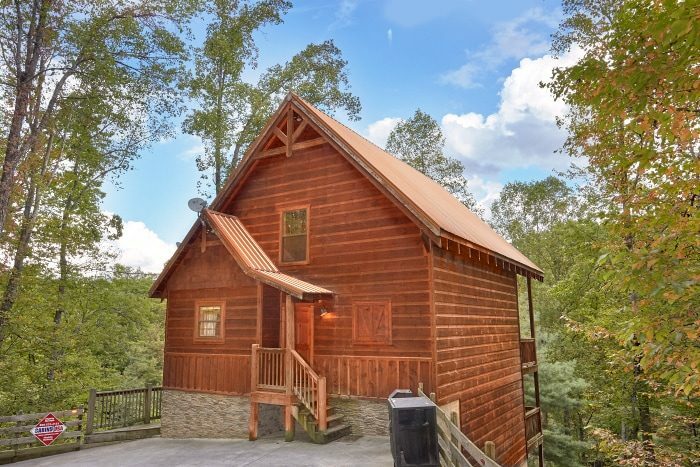 Whether you plan on spending your vacation at top-rated attractions or just sitting back in a rocking chair surrounded by nature, this cabin is a great fit for your vacation. 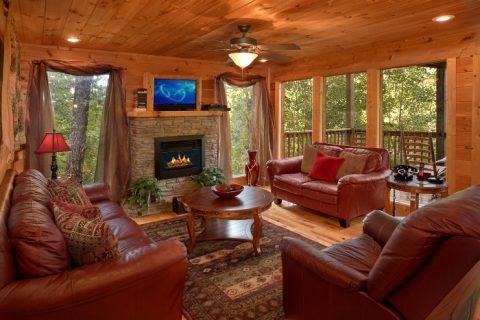 Enter into the main level and you'll find a cozy space with a leather sofa, love seat, and recliner next to an electric fireplace. Above the mantel, a flat screen television with a Blu-ray DVD player makes this room a great place for watching your favorite shows and movies. Nearby, the spacious kitchen area with sleek appliances and ample counter space is the perfect place for preparing great dinners to enjoy with friends and family. With the addition of your cabin's grill, you can enjoy truly decadent meals with steaks, ribs, or anything that suits your palate. A table with 4 chairs and the breakfast bar with 3 stools is a great place to gather for meals with family and friends. 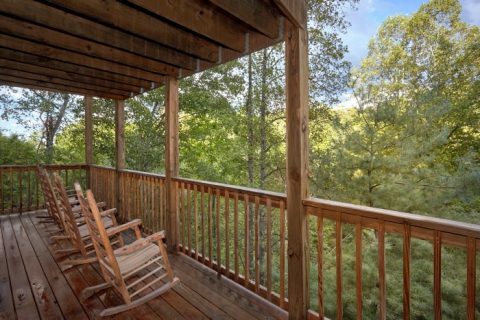 After a great dinner, step outside onto your cabin's deck to sit back in a porch rocker while you sit and listen to the sights and sounds of nature. On a clear night, you'll be able to witness the beautiful sight of a starry night sky without the dulling effects light pollution. 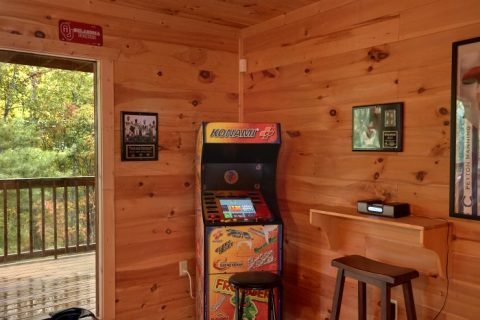 Plenty of fun and entertainment awaits downstairs in the game room and theater room area. 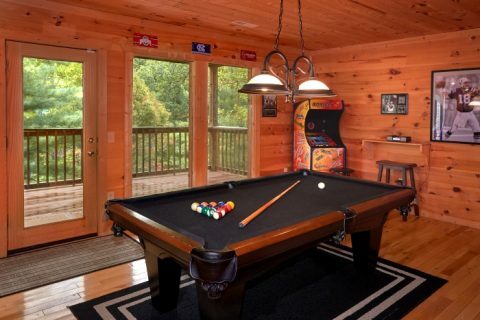 The game area comes complete with a pool table, stand up arcade game, and stereo with a cd player. 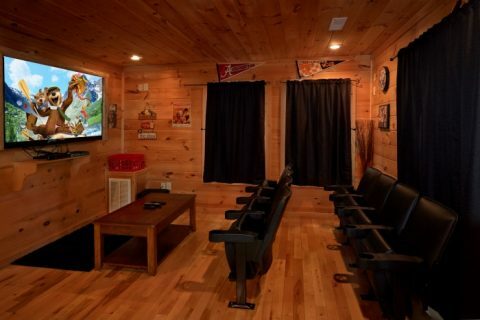 You can enjoy a movie night in style with this rental's home theater system with a 65" HDTV and 8 theater seats. 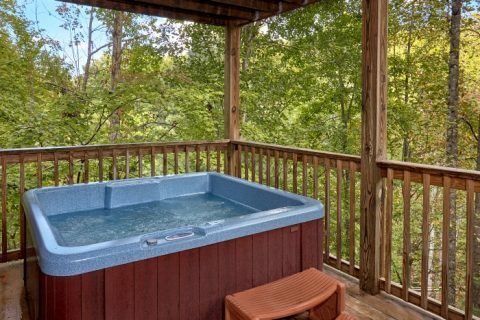 There's also access to a lower deck with a hot tub. 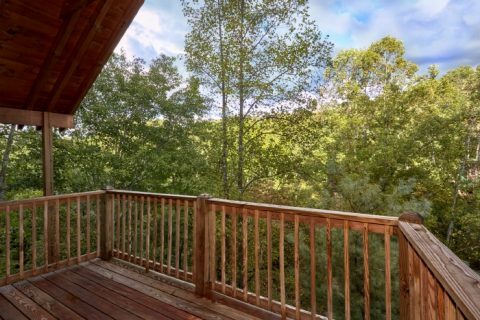 When you're ready to get some rest before your next day's adventure, you can look forward to getting some much-needed rest in this rental's 3 bedrooms. 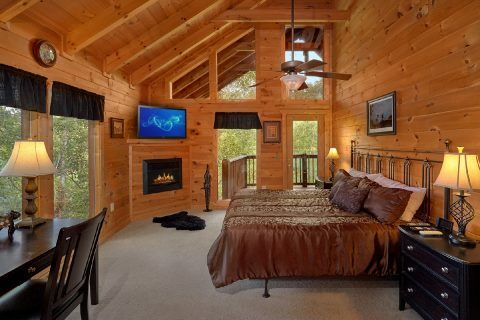 Each bedroom is housed on its own level and comes complete with a king bed and private television. 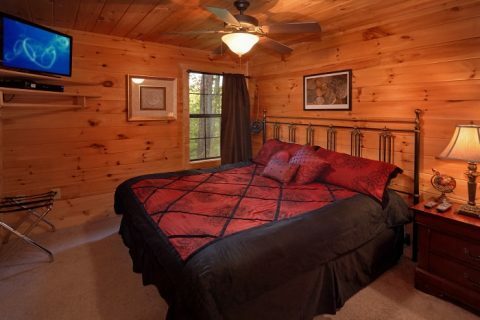 The master suite on the main level even features its own fireplace, writing desk, full bath, and access to a private deck with rocking chairs. Large picture windows from this room showcase the natural beauty that surrounds this rental. 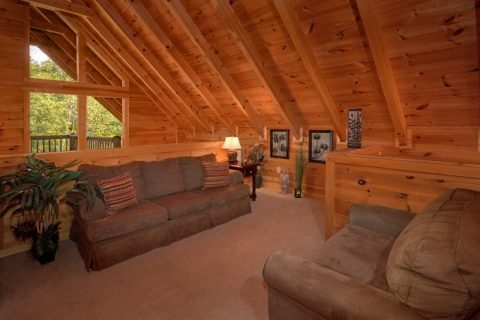 Upstairs, a twin sleeper sofa and another sofa bed in the loft area provide additional space for guests. 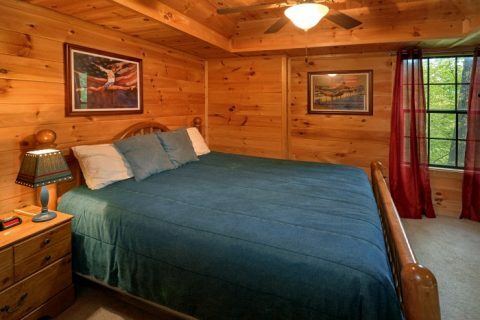 Book your very own Sky Harbor cabin online with Cabins USA to earn a special discount on your stay! You can save 15% on your lodging costs simply by calling our reservations office or reserving it online today. 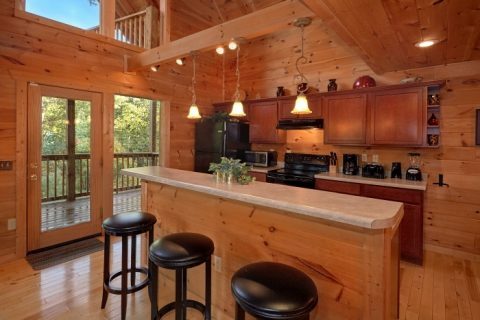 Start planning a great Smoky Mountain vacation complete with all the amenities you need for an unforgettable trip.